As for me, I ordered something far different. I went with the Giant Meatball Sandwich. This was topped with marinara and mozzarella and served on a bun with a choice of sides. Diverging from my normal path of fries, I picked corn on the cob for no reason other than the fact that I really never see corn on the cob as an option. The corn on the cob was a good choice, however, the rest of the meal could have used a little work. For starters, a bun was a bad choice for these meatballs, as there was essentially no good way to eat them. A baguette or hoagie probably would have worked better, but instead i had to work to cut apart the balls into chunks that wouldn’t squeeze out of the bun with each bite. Secondly, the balls could have been a bit juicier. They weren’t dry, per se, but a little more moisture would have gone a long way. Nonetheless, they were quite flavorful and the marinara sauce was pretty nice as well. 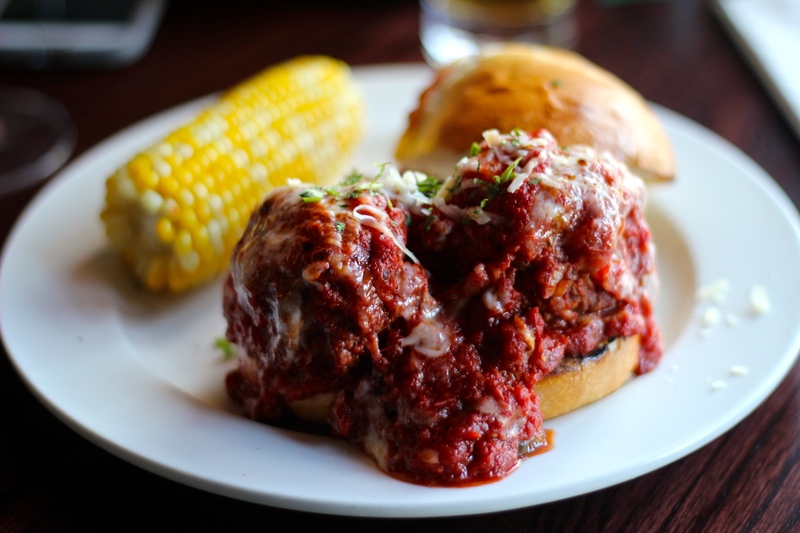 While my Giant Meatball Sandwich could have used a few tweaks, it was still pretty acceptable. Nonetheless, I was left thinking a Bar Bill sequel would have been a much better use of the space than 189.